100' 10/3 STW Water Resistant (Blue) 30A 220V Roofing Extension Cord. L630P & L630C Locking 30A 220V connectors. For use on most 30A 220V Hot Air Welding/Roof Member Seamers. Orders of 4 or more can get custom printing with customer's information for free (example: Property of XYZ Roofing 800-555-1212). 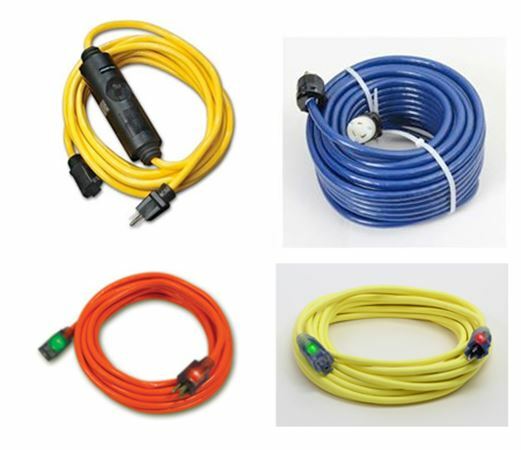 This heavy duty cold weather PVC cord has the latest safety features that all high profile & hazardous job sites require. It is fully safety compliant and its patented “CGM” (continuous ground monitoring) connector features a continuous green ground check light that lets you know the cord’s electrical current is safely grounded. In addition, the high visibility vinyl jacket insures the cord will retain its flexibility in temperatures down to -40°F. Manufactured to 12/3 AWG (American Wire Gauge) specifications. Each of the three conductors contain 65 strands of 30 AWG 100% copper wire. All copper is soft drawn & annealed for maximum flexibility under full load. SJTW outside jacket is rated at 300 volts. It's heavy duty molded-on 15A-125V NEMA 5-15 plugs & connectors will not to pull away from the cord body. Lighted amber Power Check plug. Lighted green Ground Check connector. Meets OSHA specifications for grounded 3-conductor cordsets. UL Listed and cUL Approved for Canada. Our PowerTech® 20A GFCI extension cords and adapters are the best in the industry for applications requiring ground fault safety protection, maximum performance and reliability. The GFCI solid state construction provides years of trouble free protection and interrupts the electrical circuit to a load when a fault circuit of 6mA or more is detected. PowerTech® GFCI’s need to be manually reset after a trip incident, an important feature that prevents the equipment from restarting unattended after the incident. Our SJTW (300V) cords use soft-drawn, bunch stranded 100% copper with molded on plugs and connectors which have large strain reliefs that prevent the ends from pulling away from the cord body. Our cords are manufactured with cold weather insulating and jacketing compounds. As a result, PowerTech® cords are extra flexible in temperatures well below freezing.